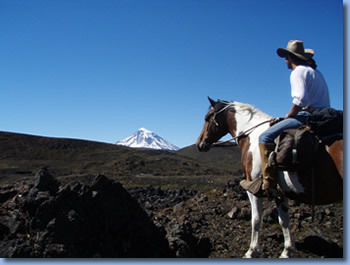 On horseback in Chile -4 day rodeo riding course. 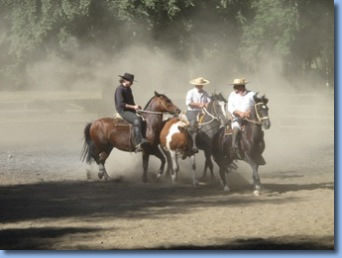 Chilean rodeo is the official national sport, so widley popular that frequently more poeple attent to rodeo championships than football games. And its nothing like the US Rodeo. 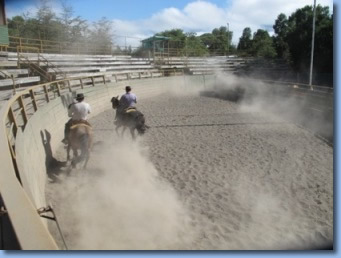 Based on the skills one needs to herd cattle, in Chilean Rodeo 2 riders drive a steer though a 65 to 80 feet wide half moon circle and stop it at a precise point by pushing the animal against the wall. Although tis may not be the most pleasant situation for a steer, in fact no animal is seriously harmed in exercising chilean rodeo properly. 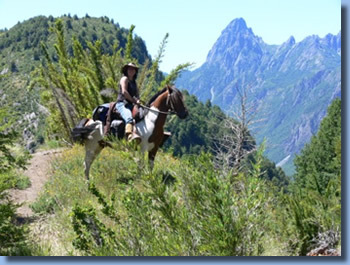 Exercising Chilean Rodeo is all about the unity with your horse and the perfect teamwork of two riders riding, running and working as one.We offer this 4 day program together wit Patricio, trainer at the "Club de Huasos" in Pucon. 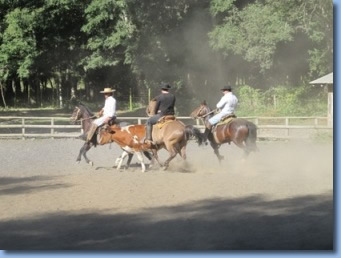 The exercises take place on the trainig ground and the "Media Luna", the halfmoon circle - arena, at Pucon's "Club de Huasos" terrain . On the last day you will drive your own steer.This programis targeted to very advanced and experienced riders as you will be running fast in limited space which requires complete control of your horse. Ideally for couples but we could provide a partner when necessary. Having started this program just last season here's some pictures and a video of Siggi and Bjarni, father and son, who where the first to attent this Rodeo Clinic. There are 2 to 3 instructors per couple. 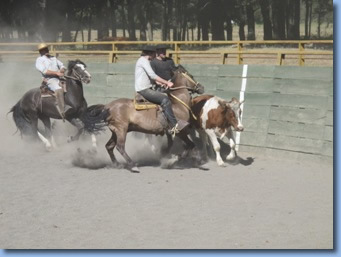 The horses are pure bread Criollo Chileno, well trained rodeo horses. We will have 2-3 hours of training per day. In the chilean rodeo the two riders that form the "Collera" drive the steer though the arena, one pushing it forward, one keeping the steer straight. you ride your horse on the training ground, learn the different moves, how to galopp sideways, drive the steer, sudden stops and turnarounds. 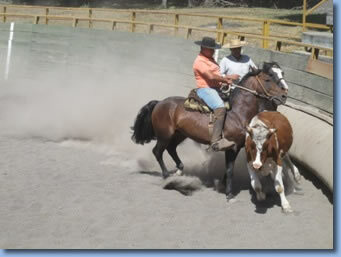 on the traing ground you will meet a steer and learn how to use these skills on the animal. you will train with an instructor and later, as you get better, with your partner. you will get to train in the actual "Media Luna"
We can customize the program, having training in the morning or evening or morning and evening thus reducing the number of days. 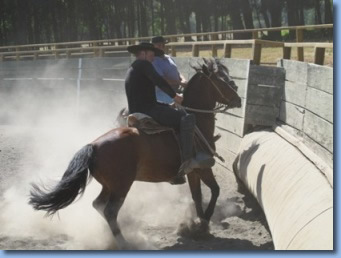 THis program aims for already trained and experienced riders. You schould be comfortable on a horse in any paste. 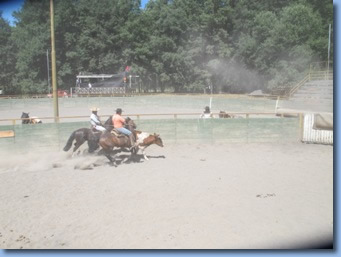 Clinic wit 2-3 instructors, horses and gear, acommodation and transportation Antilco - "Club de Huasos" training center.